PORTLAND, Maine, May 26, 2015 – Baird announced today that it has added Eric Pronovost as Branch Manager, Senior Vice President, of the firm's Portland, Maine, wealth management office. 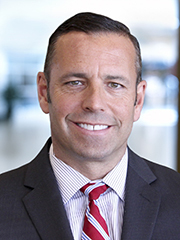 Pronovost joins from UBS Financial Services and will serve as a financial advisor in addition to managing the branch. Pronovost started his career as a financial advisor in 1991 with the former brokerage firm Lehman Brothers. He then spent time with Prudential Securities and McDonald Investments before moving to UBS in 2007. Pronovost is an active member with the Knights of Columbus and holds a bachelor's degree from the University of Maine. He lives in Cumberland Foreside, Maine. "We are very pleased to have Eric lead our Portland ofice," said Bill Johnson, Regional Director for Baird's Private Wealth Management group. "With more than 20 years of industry experience and a commitment to providing the best financial advice to clients, Eric is an excellent position to grow our presence in the market." Baird is an employee-owned, international wealth management, capital markets, private equity and asset management firm with offices in the United States, Europe and Asia. Established in 1919, Baird has more than 3,100 associates serving the needs of individual, corporate, institutional and municipal clients. Baird has more than $145 billion in client assets. Committed to being a great place to work, Baird ranked No. 5 on FORTUNE's 100 Best Companies to Work For in 2015 – its 12th consecutive year on the list. Baird's principal operating subsidiaries are Robert W. Baird & Co. in the United States and Robert W. Baird Group Ltd. in Europe. Baird also has an operating subsidiary in Asia supporting Baird's investment banking and private equity operations. For more information, please visit Baird's website at www.rwbaird.com.